We were interested to read that our views on the decline of our local high streets, expressed in our open letter to Dr Sarah Wollaston MP, received some interesting support in last weeks Dartmouth Chronicle. I am sure we can innovate on the high street to ensure its survival but I am not so sure we can change the thinking of our District Councillor’s to support our local economy better. Their focus seems to remain on the economy of the Council rather than the economy of the district they are looking after. I share the concerns of your correspondent Paul Reach about the decline of our high streets, Letters, March 9. He is right to highlight the devastating effect of huge increases in business rates as one of the causes, but what has South Hams District Council done to help? Once again it is increasing car parking charges and closing public toilets to try to balance its books to the detriment of our market towns.As an opposition group on the district council, we tabled an alternative budget.This included a 10 per cent reduction in our market town car parks and the investment in empty shops in the high streets.This investment in shops was not about trying to make money but supporting the vitality of our town centres and using accommodation above as much-needed affordable housing.The Conservative administration refused to debate these proposals. This is the same administration that voted to merge with West Devon, despite a resounding 85 per cent of local communities saying no.They were quite happy to support a 40 per cent increase in council tax to bail out West Devon but are not prepared to debate ideas that support our market towns. We looked to pay for these changes by cutting senior officers at South Hams and use some of the millions of pounds stashed away in reserves. These reserves are earning next to nothing in interest while they could be used to invest in our local economy. In the medium term we would introduce a 200 per cent council tax rate on second and holiday homes in the South Hams. This would raise an extra £800,000 a year, more than enough to cover any budget deficit. There are alternatives to increasing car park charges, closing public toilets and cutting services and many will support our market towns. We’re not saying we have all the answers but at least debate these issues with us rather than slavishly following the party line. Our local people and communities deserve better. I was also interested to read that Kingsbridge businesses have a similar problem to Dartmouth according to this letter from Michael Baker. 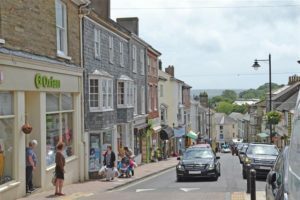 Although Kingsbridge is seen less as a tourist destination, so their problems are more probably caused by the pressure on high street retail sales rather than the marketing weaknesses in the town. I also believe that growth in online shopping doesn’t necessarily have to signal the decline of our high streets. I find it sad that people object to businesses like Costa Coffee locating in their town. For me this is an indication of how high streets need to adapt to the changes in buying patterns. People like to go shopping and meet friends ‘in town’ over a coffee. There is nothing more rewarding than the real shopping experience, (where you can try on those shoes or clothes before buying) rather than the habit I have developed – regular visits to the post office returning those online purchases that don’t fit! I am sure through innovation and creative thinking, we can fight back and ensure the high street experience has a lot of life left in it. Paul Reach, Letters, March 9, makes some very important points about the decline of retail trade in Dartmouth; we, of course, have the same problem in Kingsbridge. While there has been great debate about redeveloping the Quay car park, Fore Street is dying before our eyes. The burden of increasing business rates is obviously a key factor but more important is the impact of technology specifically internet buying and home deliveries. Kingsbridge now has a significant number of empty shops and a continual growth in the number of charity shops. It is also clear that a number of the “proper shops” are struggling. The fact is that technology in all its forms is destroying our villages and high streets. It threatens our health and our security, both personal and national. The implications are terrifying and there deserves to be a serious debate both at a local and national level.